Short Summary: These short diary entries are written by individual characters from The Brother’s Grimm fairy-tale stories. These characters tell their background stories, claiming that the Grimm Brothers never revealed the truth behind their fairy-tales. My Review: Overall, I really enjoyed this series. The prequels as a whole fit pretty well together because each of the characters have a common goal in mind. 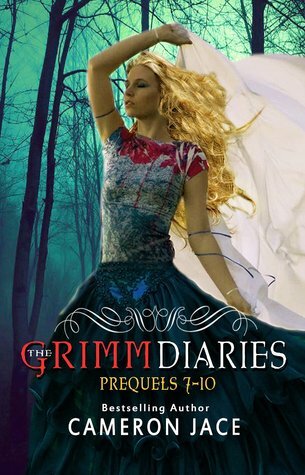 There were a few details, characters, and grammatical errors that frustrated me a little bit, but I would still recommend this series, especially to fans of the Ever After tv show. I’ve read the original Brothers Grimm tales and enjoyed them, but this is a whole new way of looking at the character roles. Cameron Jace takes the fairy-tales that end in “happily ever after” and flip them around in chaos and tragedy. You never are quiet sure who the villain is and who the hero is, which is what I like. I enjoy an author who can make you sympathize with the bad guy once in a while. I gave this one 4/5 stars only because I liked that the Queen is telling the truth about why she has to kill Snow White. Once I found out the real reason, I wasn’t too impressed. I’ll have to keep reading to see if the rest of the stories change my mind about Snow White’s character. Alice, who may turn out to be one of my favorite characters, is on the search for Cinderella. I gave this one 3/5 as well because I was intrigued, but honestly I got bored halfway through. I might even have to go back and read this one because I have already forgotten what it was about. It still fits well with the overall series, though, so I still enjoyed how it connected to the other stories. Told by Peter Pan, I gave this story a 3/5 because some of it was just ridiculous to me. I like how the author kept Peter young by making his tone playful and childish, but I did not like anything about this story except who Peter ends up being in love with. This is another one that fits really well into the overall series. 5/5. My absolute favorite story so far. Red hoods, wolves, and death. Great combination. I loved everything about this story, and would love to see how the characters fit into the rest of the books. I rated it 2/5. It was not my favorite. I did not like anything about it. It was inappropriately tragic. I read through it quickly just to get on with the next story. I rated this story 4/5. I really loved how Jack and Prince Charming team up to attempt a rescue. I was not expecting it to end the way it did, and I’m not even sure I like the Shakespeare reference (since I’m such a Shakespeare nut). I was a little disappointed how this one ended. Jack acts too much like Peter Pan in this story too, which is something I wasn’t fond of. 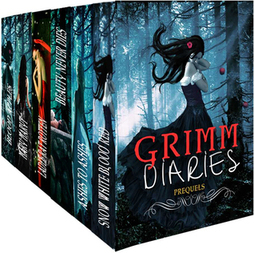 Short Summary: The second group of prequels of the Grimm Diaries, which follow Beauty and the Beast, a Mermaid, Jack and the Beanstalk, Rumpelstiltskin, and Jacob Grimm. My Review: So much better than the first few prequels. It is clear that the there is a solid direction in which the books will eventually lead to, which I also thought was lacking in the first ones. I enjoyed the characters a lot more in these stories. Secrets are still unfolding as the characters tell the truth that the Grimm brothers covered up with their fairy-tale stories. The main reason I am really starting to take a disliking to this series is because they are just prequels…that’s it. Honestly, this could have been the end of the prequels, even if there are other characters coming later. I’m bored of the prequels and ready to read the actual book series. My Pride and Prejudice Obsession is Unshakable!